GBA Metal Slug Advance (USA) "100%" in 38:50.38 by mtvf1. 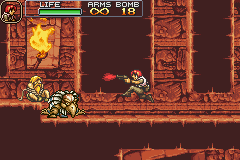 Metal Slug Advance is an action shooter game from the popular series Metal Slug. In it, you are a recruit for Peregrine Falcon, training on an unnamed island with limited equipment. All seems to be going as planned, but when General Morden's troops invade the island, captures many of your allies, and attempts to build a base, you must rise to the task of fending off the approaching army. There are some key differences between Metal Slug Advance and other games of the Metal Slug series. In this game, you have a health meter, so damage boosts can be used to save time. Also, there are collectable cards which provide bonuses or upgrade power of certain attacks. This run aims for 100% completion, which completes all stages and collects all the cards. This requires replaying many stages to accomplish different goals. There is also one death in the movie, because one card is obtained by dying. See the submission comments for more details. You can also see runs of Metal Slug, Metal Slug X, Metal Slug 3, Metal Slug 4, and Metal Slug 7. You can also watch an any% run which does not collect all the cards. Besides the main YouTube encode featured here, there is an alternate one with a HUD that displays gameplay statistics such as enemy HP, number of cards obtained, and the protagonist's X and Y position.